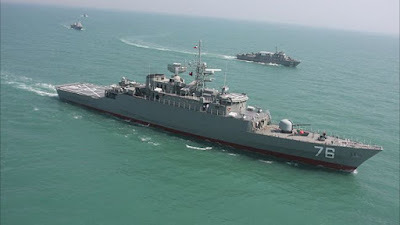 Taking this declaration at face value, Al-Monitor contributor Abbas Qaidaari noted that while "Iran's limited fleet is incapable of facing possible threats of much stronger naval fleets... the presence of a middle power such as Iran in the Atlantic Ocean could have a major psychological impact on its rivals, especially the United States." Qaidaari continues, "It thus appears that Iran, just as is the case with its missile program, is trying to use its navy to achieve the goals of its broader gunboat diplomacy," speculating that "countries such as Venezuela and Cuba would be likely hosts." In September 2012, Congressman Jeff Duncan, a Republican from South Carolina, argued in favor of passing his own "Countering Iran in the Western Hemisphere Act of 2012," warning of an "emerging Iranian-backed terror network here in the Western Hemisphere" and insisting that the "U.S. must have the capabilities to defend itself from a potential Iranian attack on the homeland." In his litany of nefarious Iranian activity, Duncan lamented, "Since 2005, Iran has increased its embassies from 6 to 11 and built 17 cultural centers in Latin America. Iran's diplomacy has led to soaring trade with Latin American countries. Brazil increased its exports to Iran seven-fold over the past decade to an annual level of $2.12 billion. Iranian trade with Argentina and Ecuador has grown, and economic contracts between Iran and Venezuela have exploded to more than $20 billion in trade and cooperation agreements." Still, the hysteria worked. Not only did both houses of Congress pass the bill, President Obama actually signed it into law in December of that year. 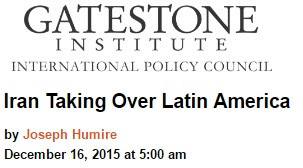 A mere six months later, a State Department assessment concluded that "Iranian influence in Latin America and the Caribbean is waning." 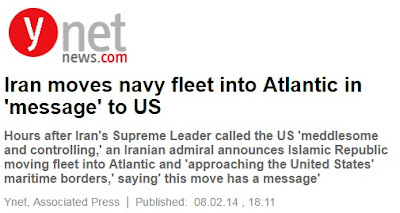 But Duncan hasn't let up his crusade to play Paul Revere warning of the coming Iranian invasion. 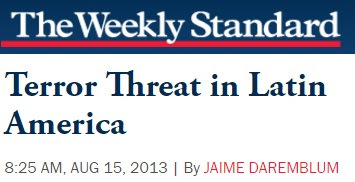 Hyping the threat of bloodthirsty Iranians lurking beneath our southern border is an obsession of his. On July 9, 2013, he held a House Subcommittee hearing, entitled, "Threat to the Homeland: Iran's Extending Influence in the Western Hemisphere," featuring a who's-who of neocon think tankers like Douglas Farah, Matthew Levitt of AIPAC-offshoot WINEP and Ilan Berman of the American Foreign Policy Council. In March 2015, he held another hearing about the same thing. "The real purpose of the hype is to bring the Iranian threat home," writes journalist Belén Fernández, "justifying the increased militarization of our backyard and Iran's in one stroke. 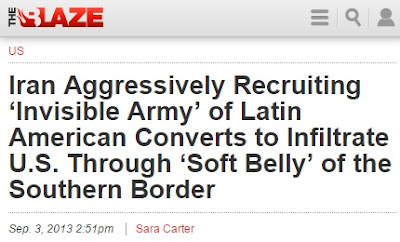 It's the same playbook Reagan drew on when he warned that the Sandinistas were 'just two days' driving time from Harlingen, Texas.' Such rhetoric means more money for the defense and border fortification industries, and preemptively validates any eventual Israeli or U.S. aggression against Iran." 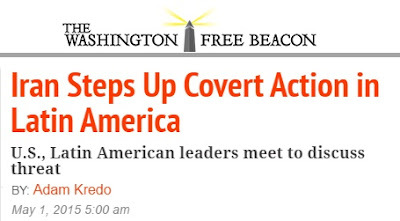 Similar propaganda both preceded and followed the Reagan administration's invasion of Grenada in 1983. In a televised speech to the American people, President Reagan declared on March 24, 1983, "On the small island of Grenada, at the southern end of the Caribbean chain, the Cubans, with Soviet financing and backing, are in the process of building an airfield with a 10,000-foot runway. Grenada doesn't even have an air force. Who is it intended for? ... The Soviet-Cuban militarization of Grenada, in short, can only be seen as power projection into the region." After the invasion, Reagan was triumphant. "We got there just in time," he crowed, claiming that the military mission had prevented a planned "Cuban occupation of the island." Grenada, he said, "was a Soviet-Cuban colony being readied as a major military bastion to export terrorism and undermine democracy." A week later, news reports told a very different story. "In the aftermath of last week's invasion of Grenada," reported The New York Times on November 6, 1983, "it has become clear that Reagan Administration officials and military authorities disseminated much inaccurate information and many unproven assertions. They did so while withholding significant facts and impeding efforts by the journalists to verify official statements." It was soon discovered that breathless claims of the number of Cuban military personnel on the island had been massively inflated, while the purported discovery of warehouses with "weapons and ammunition stacked almost to the ceiling, enough to supply thousands of terrorists" were grossly exaggerated. Now, decades later and with no Cold War to keep military fires burning, the Red Scare has been replaced with a Persian Menace. As always, what's also missing from all of these terrifying tales of America-based Iranian argonauts and agents is the fact that Iran - like most nations on the planet - doesn't actually have a single permanent overseas base. When it comes to foreign military outposts, however, no one even comes close to the United States. "Despite recently closing hundreds of bases in Iraq and Afghanistan," American University professor David Vines wrote last year, "the United States still maintains nearly 800 military bases in more than 70 countries and territories abroad—from giant 'Little Americas' to small radar facilities. Britain, France and Russia, by contrast, have about 30 foreign bases combined." 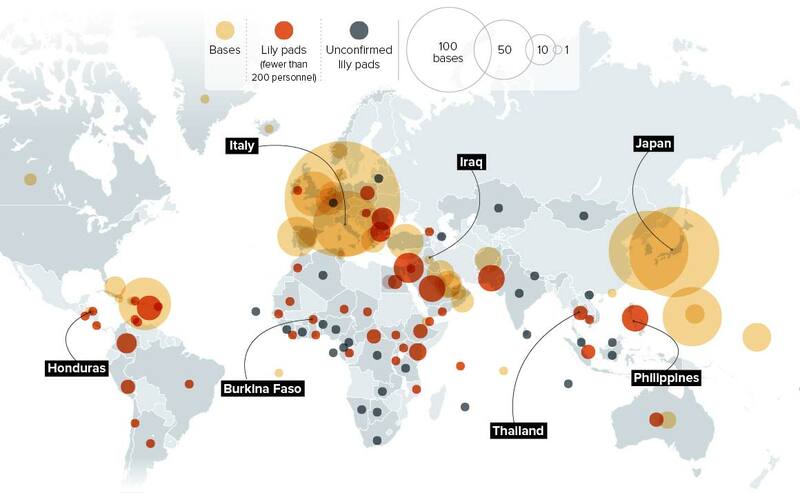 This means that "the United States has approximately 95% of the world’s foreign bases." Vines, author of Base Nation, explains that "[a]lthough few Americans realize it, the United States likely has more bases in foreign lands than any other people, nation, or empire in history." Consequently, our own imperialism goes unquestioned and ignored as "we consider the situation normal and accept that US military installations exist in staggering numbers in other countries, on other peoples' land. On the other hand, the idea that there would be foreign bases on US soil is unthinkable." Even the US Navy's own recruitment commercials boast of omnipresence. 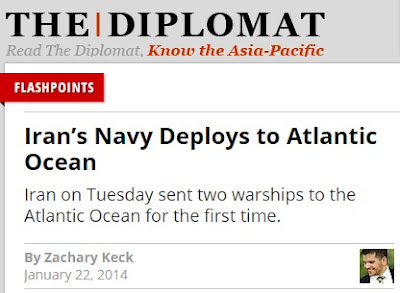 Not only self-labelled "a global force for good" that's "100% on watch" across the seven seas, the Navy is also positioned as operating without limitation or restraint in the American bathtub known as Planet Earth. 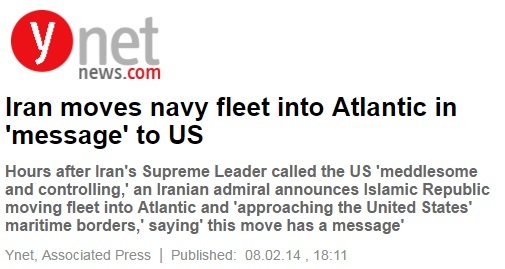 And that's what this hysteria about Iran is all about, really. The threat doesn't actually exist, but the mere implication by Iran that it would dare send soldiers or sailors so far from home and so close to the shores of the US empire is so unimaginable that bills must be passed, sanctions imposed, walls built, troops deployed, and brows furrowed. In essence, all reactions to Iranian pronouncements echo a similar tune: just who do they think they are and why don't they know their place? So, no, the Iranians aren't coming. But, fear not, more frenzied headlines and incredulous pearl-clutching surely will be.